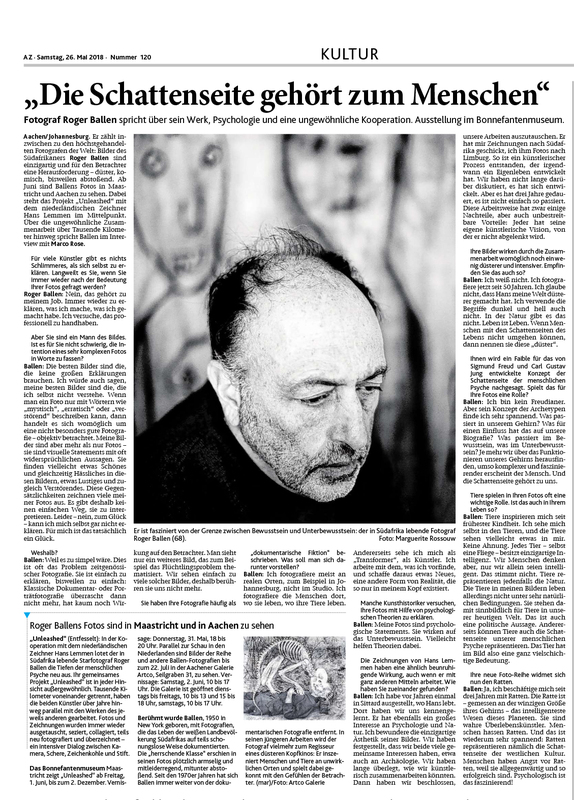 "Die Schattenseite gehört zum Menschen"
On the 26th of May 2018, the newspaper ‘Aachener Zeitung’ ran a headlining interview article about South-Africa based artist Roger Ballen, in which he reflects on his work, psychology and the recent highly unusual cooperation with Dutch draughtsman Hans Lemmen: UNLEASHED - works of which have been on display in both, the Bonnefanten Museum in Maastricht and ARTCO Gallery in Aachen. In the article titled "Die Schattenseite gehört zum Menschen", which may be translated to ‘The dark side belongs to humans', Ballen talks the Project “Unleashed” and how he had initially met Hans Lemmen in Sittard (NL). At this occasion, the two discovered that they share a mutual interest in a diverse set of topics ranging from Psychology and Nature to Archaeology. That is when they decided to attempt working together. Subsequently, they exchanged their works – Lemmen sending illustrations over to South Africa and Bellen photos to Limburg – from which an artistic process emerged, which eventually developed 'a life of its own', as put by Ballen. As he elucidates, the cooperation has grown rather organically - a creative process combining their much-varied techniques being the result. Photos and drawings were exchanged over and over again, resulting in an intensive dialogue between the two, facilitated by the means of camera, scissors, charcoal and pen. Ultimately, each of them utilized the medium of the respectively other as their own material. This endeavour culminated in UNLEASHED. Unleashed was on display in ARTCO Gallery in Aachen, in the Exhibition ALTER EGO (2nd of June - 22nd of July 2018).